What do you do when your other half gets hold of a Peugeot 207 CC? Exactly! You take the roof down, and head somewhere scenic. We decided to head towards Yorkshire, to Settle, to be exact. With the impressive Ribblehead Viaduct just a few miles up the road, you can't really go more scenic. Because the car will be the star of a feature my boyfriend is writing for the next issue of Gr8 Life magazine, I was asked to provide the photography for it. I've never taken promotional pictures before, but I gave it my best shot (pun intended). Since Settle is also one of the end points of the famous Settle-Carlisle Railway, we decided to have a race. Could the car get to Carlisle before the train pulled into the station? And that without breaking the speed limit? After grabbing a bite to eat in Settle, it was time to hit the road, or tracks, as it were. I've never been on the iconic railway before, nor was the car left in my care, so it was obvious I would be the one taking the train. However, that also gave me the chance to take in the views without having to keep my eyes on the road. Unfortunately, even though I had every faith in the train, and was still in the lead when the train went through Appleby while the Peugeot had just cleared Shap, the train pulled into the station 15 minutes after the car pulled up. Leaving my boyfriend to wait for me on the platform and look smug, and a passenger on the train - who had noticed we were having a race - to comment "How the hell did that gentleman you were with in Settle get here before you did?" Good question, but I was assured that no speeding was involved. Cruising through the Yorkshire Dales with the top down was fun, however it was also freezing as it is still March after all. That didn't stop the walkers at the Ribblehead Viaduct though, who warmed themselves back up with coffees and teas from the coffee van, and full English breakfasts from the mobile canteen. The train passengers got the views, but not the view of the viaduct - although that didn't stop them from getting up and trying to catch a glimpse. Virtual Travel - a "real" holiday experience? If your friend tells you that she's just strolled down New York's Fifth Avenue or around Sydney's The Rocks while on her lunch break, chances are she probably has. With Google Street View now another feature on Google Maps (accessed through the "more" tag), taking in the street scene in your destination of choice does not require saving up, flying or getting days off work anymore. Instead, it is possible to log onto any computer in the world and go there in a few mouse clicks. You will be missing out on the smells and sounds of the neighbourhoods, but it will still feel like you are walking along there. You can even look up to the sky or stare at the ground. Just don't go singing "I'm an Englishman in New York"... if you're on a public computer. 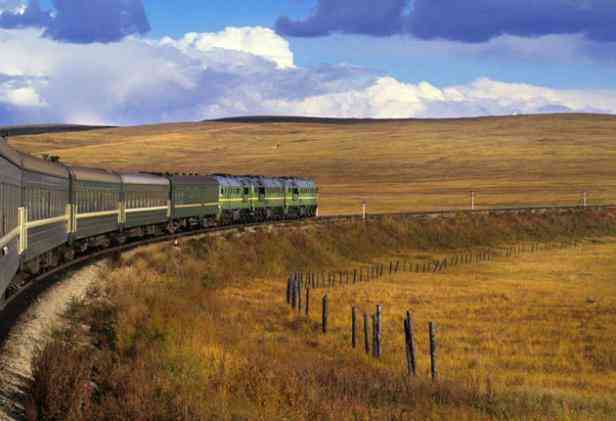 The coup, however, is that you can now travel on one of the most iconic trains in the world - the Trans-Siberian Railway, from the outskirts of Moscow all the way to the Pacific terminal at Vladivostok in the space of 40 minutes, courtesy of Google and Russian Railways. You cross the river Volga, go through the lower Ural mountains, stop in Yekaterinburg, travel over the Barabinskaya steppe, take in Novosibirsk, see the Baikal Lake and dawn over the Zeya river before crossing the Khekhtsirsky Range and pulling into Vladivostok where the train terminates. The epic rail journey is even made more authentic than just watching another youtube video - you get to choose the noise backdrop, from the rumble of the wheels and Russian banter on the radio, to having someone read Tolstoy's War and Peace and play balalaika music, you're made to believe that you are actually on that train. The youtube videos themselves have no sound on them so you need to go to the google page for your sound effects, but there are a total of 150 hours of Trans-Sib videos online, so you can spend as long as you like on the train. But does this still count as travel? Websites of famous museums like the Louvre and El Prado have offered virtual tours through their prized galleries for yonks... If you've seen it online a thousand times, do you still go and pay to see the Mona Lisa in person? Granted, online access does have advantages. You can stay dry if it's pouring down outside and you save yourself travel time and admission fees. It's good for research from home or visiting a place to re-familiarise yourself with it. But when did visitors to the website become visitors to the actual attraction? Most attractions in the world now offer panoramic, 360° views on the website, have photo galleries and aerial views. Links and captions give you all you need to know - but can it replace the guide who shows you around in person? Who points little things out to you and brightens the experience up with little anecdotes or jokes here and there? Who might know some hidden gems and spectacular views you would have missed exploring on your own. Audio guides were designed a long time ago, so people can explore an attraction in their own time... but they still had to get there. They made the effort to go and see it for themselves. I know of quite a few people, and I am definitely one of them, who can resist temptation to watch the Trans-Siberian video. And that's simply because I don't want the experience spoilt. If I ever get to travel all the way from Moscow to Vladivostok on this famous railway, I want the element of surprise. I don't want to know what can be seen from the window of the carriage until I actually see it with my own eyes. To many, the whole purpose of travelling is to explore the world with their own eyes in their own time, and they don't want someone else to take this sense of adventure and achievement away from them. Google Street View is fun for trying to spot your car outside your house or your cat sitting in the window. Even re-visiting a place you have already been to is fine by me, or checking where in the world those dearly-beloved travellers say they are. But not experiencing Fifth Avenue in New York, Ku'damm in Berlin, Circular Quay in Sydney or Oxford Street in London for yourself just because you've clicked through it on your computer means you'll be missing out on everything except the sights. You won't be able to buy a hot dog off one of the street vendors and get in line with the businessmen at lunchtime. Dressing up and taking a look around Tiffany's just to say you've been there won't be possible from your sofa - granted, you could visit their website, but that wouldn't really be Audrey Hepburn style now, would it? The same goes for clicking around Sydney. You could click around the Harbour Bridge all you like, but you couldn't take in the street atmosphere of The Rocks, catch the ferry or get your photo taken outside the Sydney Opera House. Travel is all about experiencing a place - and I doubt that the virtual tourism experience can ever match the real deal. 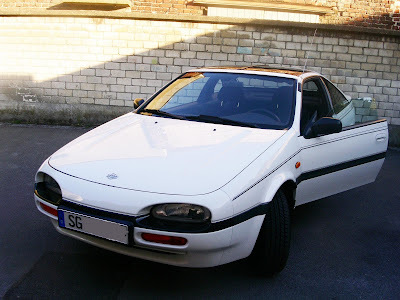 This is my Nissan 100NX that I've had since I was 16. My other half has just written a blog about the latest Nissan sports car, the eco-friendly and not at all inspiring-sounding Leaf, and used my car to demonstrate what Nissan could do. The Leaf's motor in the modern equivalent of the 100NX (which went out of production in 1994) would be the "perfect socially-minded sports car." I love this car to bits, 18 years old and has never let me down once! It takes some getting used to, as it's quite low, and the bonnet is wider than you'd think, but take the glass roof out on a summer's day and it's perfect to hoon around in! And since it's appeared on a blog that's probably read by more people than this one is, I guess my car is famous now! 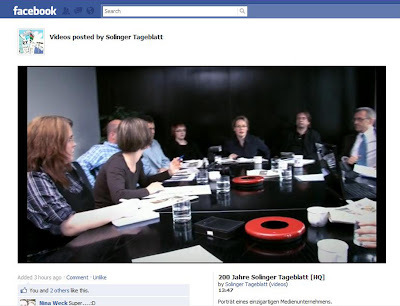 In 2009, the Solinger Tageblatt, the local paper I write for at home in Germany, celebrated its 200th anniversary. While I was doing work experience there, a promotional video was shot to capture the Tageblatt today and give a bit of the publication's history as well. Today, this video was posted on Facebook. I remember, that while they were filming it, a news conference was held and all staff reporters were asked to attend. However, local editor Andreas Baumann and editor-in-chief Stefan M. Kob insisted that I should attend as well. After all, I was already working freelance for them at the time as well, getting published on the youth page Karl. and covering the odd out-of-hours story for the local section. My German dancing partner Patrick has just sent me an email. He is in Brisbane, Australia, after three days in Shanghai, and strolling through the city like we did together three years ago. 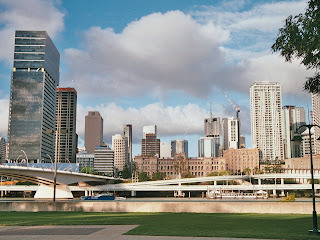 You see, I went to Brisbane on my Gap Year in 2007, and Patrick went there as an exchange student at the same time, so I visited him for 2 weeks. 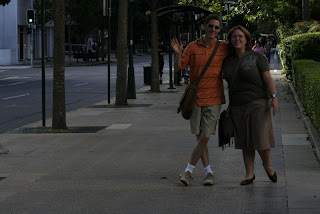 We both enjoyed Australia, and before I started university, we made the plan to return Down Under together, once we both graduated from uni. Unfortunately however, I couldn't go through with the plan. First of all, Patrick finished uni recently, whereas I still have a few months to go. I also doubt that my other half would have liked it, if I went around the world with another bloke for a few months. But most of all, I couldn't afford the trip anyway. But now that the emails come in, I remember the fun times on the road. Patrick and I had planned to travel along the Great Ocean Road together - he's heading there next week and I am still in the UK. Sometimes I miss the travelling. Going further afield than Wales or Germany. I miss the adventure, the unknown. I like going around the UK and exploring Britain, but I guess my feet will always be itching. I have just sent off my application to the Finnish Embassy. But I am not looking for a job, I am applying for a training programme. In its 19th year, the Foreign Correspondents' Programme gives recent journalism graduates and final year students from various European countries the chance to go to Finland for a month on a full scholarship, and meet politicians, learn about the culture, see the various regions of the country and apply their journalistic skills. To me, this sounds like an excellent opportunity. The training takes place for the month of August (1st until 29th) in Helsinki, and you live in a single room in the student's halls of residence. You'll also get the chance to learn some words in Finnish and spend a weekend with a host family. The application deadline is 31st March, so hurry, if you want to go to Finland during the summer! The link above is for British citizens - although it says that residents can also apply to the Embassy in London, this is not the case. If you hold a foreign passport, you need to go to the Finnish Embassy in your country! We are the children, the children of Rock 'n' Roll! All of you were just like us! Dancing and feeling, life is wonderful, we want that as much as you. The fever started over thirty years ago. Bill Haley was our very first superstar. We went completely crazy when Elvis and Chuck Berry sang. - How your children had to turn out was crystal clear. When Paul McCartney sang, we all started to dream. The Rolling Stones were good for those long, hot nights. The girls were in love with John, George and Ringo Starr. - Rock 'n' Roll lives on, 'cos it's in our blood! We've had you figured out long ago. You used to be too loud once too. You started with a sudden burst, and kicked everything to the wall. Every year in summer, the International Musical Eisteddfod in Llangollen brings competing choirs, dancers and world-class musicians to Wales. 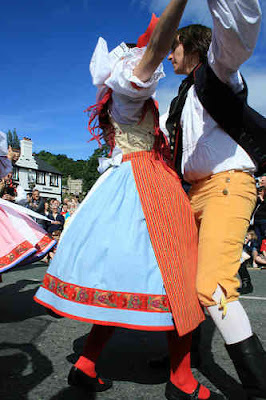 Conny Kaufmann has a look at what Llangollen 2010 has in store for visitors. Since 1947, the annual Eisteddfod has been the starting point for many careers in music and dance. Up to 5000 visitor flock into the small Welsh town, and turn it into a cultural melting and meeting pot for a week. This year's festival will take place from 5th to 11th July. Although the Celebrity Opening Gala concert line-up has yet to be announced (check the Llangollen 2010 website from 20th March onwards), the organisers are already certain that it will be "a night to remember" and not to be missed. The next day is a Children's Day about exotic traditions during the day, before Karl Jenkins and pianist Llyr Williams take to the stage with The Armed Man: A Mass for Peace along with the Sinfonia Cymru making it's Eisteddfod debút. Wednesday will see the International Song & Dance Day, with choirs and folk dancers from all over the world participating. At night, the One World, One Stage event will be hosted by Terry Waite and include a procession of performers through the Royal International Pavillion. Thursday is all up for Youth Entertains, inviting young singers and folk dancers to the stage with Songs from the Shows as well as the biggest ever Junior Children's Choir. The evening will see Shine with Bond, and international dance acts. The organisers of the International Eisteddfod call Friday the "essence of Llangollen" as it's the Celtic and Folk Day. New competitions have been set up for folk performers, which will be a first at the festival. At night, award-winning ensemble Only Men Aloud will perform Welsh favourites. Bring the whole familiy Saturday for the International Family Day with activities for all ages. There will be competitions and crafts, and the best male and female choirs of the world. In 1955, Luciano Pavarotti won the choir competition along with his father, and he returned to Llangollen in 1995 as star performer. The best choirs will have a "sing off" at night to be names Choir of the World, and receive the Pavarotti Trophy. Sunday marks the end of the Eisteddfod, with violinist Nigel Kennedy taking the stage together with his full orchestra and band. As the festival's star performer, he will join the rangs of Dame Kiri Te Kanawa, Plácido Domingo and Montserrat Caballé. Many star musicians started their careers in Llangollen - one more reason to come and see what makes this small Welsh town so internationally known. And who knows, you might see the next Pavarotti live on stage! The Eisteddfod holds fun for the whole family and everyone from the kids to grand-parents should find a performance they can enjoy. You think that Llangollen has not been worth the trip since the Dr Who museum closed down and there is nothing else to do there except for riding the steam train? Let Conny Kaufmann prove you wrong! The International Musical Eisteddfod mentioned in the slideshow will take place from 5th - 11th July 2010. There is something magical about travelling on a steam-powered train. Conny Kaufmann heads down to Llangollen in Wales to ride the Llangollen Railway and experience train travel of days gone past. If you are in Wales and have a fable for vintage trains, the Llangollen Railway is not the only one you should check out. Several Light and Steam trains still operate across northern Wales. These include the Bala Lake Railway, which runs between Bala and Llanuwchllyn; the Llanberis Lake Railway which runs alongside the lake between Llanberis and Penllyn and gives you access to the Snowdon Mountain railway as well; the Welshpool and Llanfair Light Railway with its balconied coaches; the Talyllyn Railway - the world's first preserved railway - running between Tywyn and Nant Gwernol; the Vale of Rheidol Railway which runs from Aberystwyth to Devil's Bridge and the Ffestiniog & Welsh Highland Railways, which run from Blaenau Ffestiniog to Porthmadog (second to last stop Minffordd lets you experience Portmeirion village) and from Porthmadog to Caernarfon respectively. In December 2009, we were asked to look at Carlisle from a "Resident - but tourist for a day" angle, and do a small documentary about what we found out for our Post-Modern Tourism module at the University of Cumbria. This video was made by Conny Kaufmann and Lauren Moore.